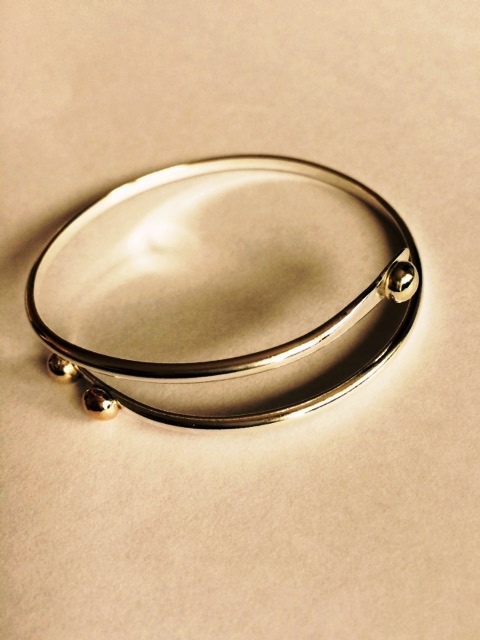 Wrap-around stylish handmade sterling silver bangle with 3 substantial gold nuggets. One nugget in white gold, one in rose gold and the other in yellow gold. The bangle is then polished to a high shine or may be textured upon request. It is hallmarked by the London Assay Office and also includes my sponsors mark. This design is also available with all three nuggets in white, yellow and rose gold or with silver nuggets. Bangles are usually supplied in medium size (6.5cm internal diameter) but other sizes can be made to order.